Sphere Leadership will operate under the license of Australian Soap Box Derby. Gnata, Founder, Owner, and Director at Sphere Leadership. The All-American Racing Program dates back to 1934 when the first All- American Soap Box Derby World Championship race was held in Dayton, Ohio. Today, 400-plus kids from around the world annually earn a spot in the FirstEnergy All-American Soap Box Derby in Akron, Ohio via qualifying races in more than 110 racing sites. The Derby began its education initiative in 2010 with the creation of the Gravity Racing Challenge (GRC) STEM Team Competition. Two Soap Box Derby cars were placed in the National Inventors Hall of Fame School as a test to see if children in a classroom setting would benefit from constructing, fine-tuning and racing Derby cars. The GRC is now held in seven different locations and has grown to include more than 300 teams. The teams come from traditional classroom settings, after-school programs and youth programs such as Boy Scouts, Girls Scouts, and Boys and Girls Clubs. 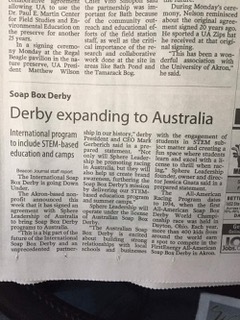 About International Soap Box Derby, Inc. The Soap Box Derby is an international nonprofit organization whose mission is to build knowledge and character, and to create meaningful experiences through collaboration and fair and honest competition. The Derby’s Core Values and Drivers include: Youth Education and Leadership Development; Family Engagement and Enrichment; Honesty, Integrity and Perseverance; Innovation and Entrepreneurship; Teamwork and Collaboration; Mentoring; Volunteerism, and Commitment to Community. The Derby’s two youth initiatives are the FirstEnergy All-American Soap Box Derby racing program and the STEM-based Education Program, which provides educational opportunities for K-12 youth worldwide through Soap Box Derby racing. The Derby dates back to 1934 when the first All-American race was held in Dayton, Ohio.